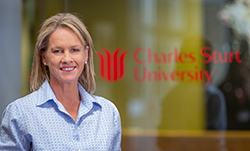 Charles Sturt University (CSU) Strategic Adviser Regional Development the Hon. Fiona Nash will open the second Women in Agribusiness and Primary Industries Leadership Summit in Melbourne on Wednesday 14 November. Charles Sturt University (CSU) announced today a $100,000 research commitment to assist in addressing labour market challenges in rural and regional areas. A lack of skilled workers in traditionally male-dominated trades has become a major problem in regional NSW, and a team of CSU researchers is investigating how women can help address the problem. A national customs research centre based at CSU is helping to free up trading barriers for global exporters, including in Australia. A program led by CSU is making inroads into mathematics education in the isolated and ancient Pilbara region of Western Australia. A long-standing partnership between CSU and TAFE NSW Riverina Institute that aims to improve access to quality education across the region is set to be extended. Victorian Minister for Higher Education and Skills, the Hon. Mr Nick Wakeling, MP, will visit an important collaboration between leading tertiary education providers in North East Victoria on Wednesday 23 July.